1st hole-in-one on #9 wins a NEW LEXUS AUTOMOBILE! Teams of 4 must register together. You may either complete the online registration & pay online - OR - download, print and mail completed forms to the DUMC office along with checks payable to: Davidsonville United Methodist Church - UMM. Thank you, for singing up for the 2018 Fairways of Faith Golf Tournament! $120 per person - includes green fee, cart, breakfast, lunch, refreshments & prizes! Please select "One Time Gift" & "Golf" when making your payment. Have a business you want to advertise at our tournament? 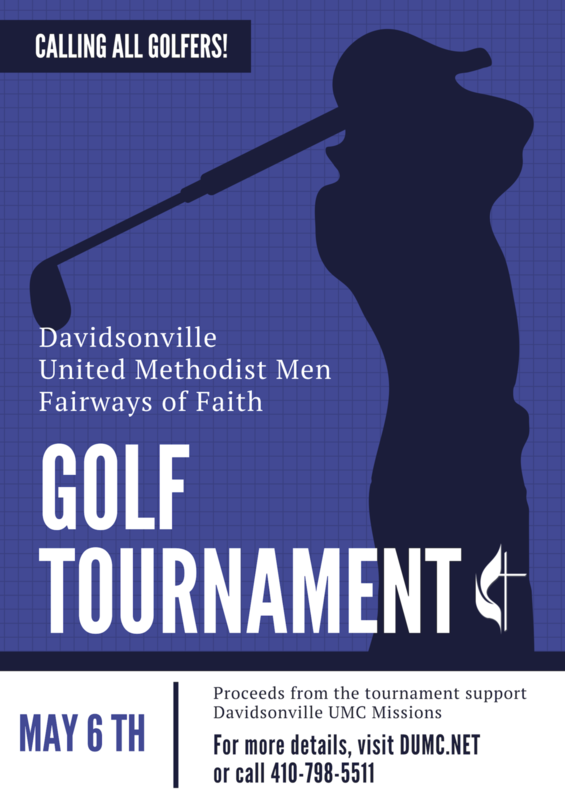 We are accepting sponsorships for our 2018 Fairways of Faith Golf Tournament. Sponsors donations go towards DUMC Youth Missions. in the past the donations from golf sponsors has gone towards the youth missions projects in North Carolina, Kentucky, Tennessee, West Virginia & Pennsylvania. This year we are expanding our financial support to other youth ministries, including college scholarships. Business Sponsors of the golf tournament will have their name posted on a sign at a hole on the golf course, all carts, and will be listed in the event program.